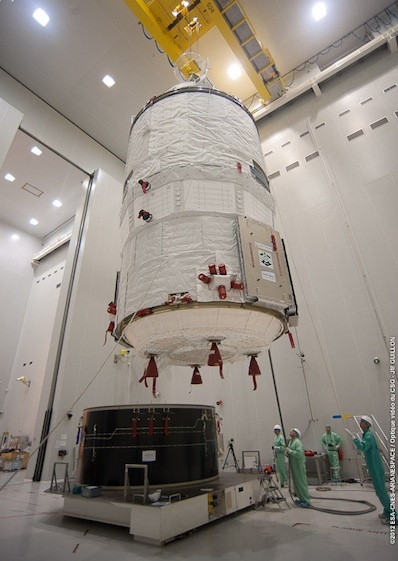 Europe's third Automated Transfer Vehicle was moved to the Ariane 5 launcher's final assembly building Tuesday, commencing the last phase of the cargo freighter's launch campaign before blasting off March 9 for the International Space Station. Outfitted with eight supply racks, two more than the first two ATV missions, craft will carry about 1,300 pounds more dry cargo than the disposable freighter's previous flight last year. "Every cubic centimeter of the carrier is at full capability," said a European Space Agency fact sheet. The ATV is the space station's largest resupply vessel following the retirement of the space shuttle. It's also loaded with more than 3,000 pounds less rocket fuel than the ATV 2 flight, which boosted the space station's orbit by 22 miles in June 2011. No such reboost is planned for the ATV 3 mission. Officials can adjust the cargo manifest on each ATV mission based on the needs of the space station. ATV 3 carries 220 pounds of pressurized gas and 75 gallons of potable water for the outpost's atmosphere and residents. 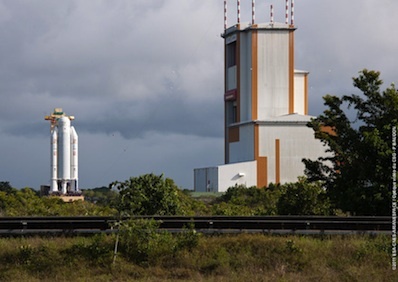 The spacecraft is being prepared for launch in March from the Guiana Space Center, a European-run spaceport in French Guiana on the northeast coast of South America. Already filled with propellant, water, pressurized air and oxygen, and most of its dry cargo, the 32-foot-long spacecraft was slowly towed from the Guiana Space Center's S5 processing facility to the Ariane 5's final assembly building Tuesday night, according to Massimo Cislaghi, ESA's manager of the ATV 3 mission. The adapter connecting the ATV with the Ariane 5 launcher's upper stage was scheduled to be added to the rocket Wednesday, and the 22-ton cargo freighter will be lifted on top of the launcher Thursday, crowning the 165-foot-tall vehicle. The Ariane 5's payload fairing will be added to encapsulate the ATV on Feb. 27, according to Cislaghi. The ATV will refuel the space station with maneuvering propellant, replenish the outpost's atmosphere with oxygen and air, and deliver 4,850 pounds of dry cargo, including spare parts, food and payloads. Launch of the ATV is scheduled for March 9 at about 1000 GMT (5 a.m. EST). The robotic spacecraft will dock with the space station's Zvezda service module March 19 at 0238 GMT (10:38 p.m. EDT on March 18), according to projections. The launch and docking times will be adjusted over the coming weeks. Using special techniques while the ATV is mounted on top of the launcher, technicians will next week load nearly 1,179 pounds more cargo into the freighter's pressurized cabin. The complex process will take two days to complete beginning Feb. 14, according to Cislaghi. Engineers expanded the late cargo load for ATV 3, doubling the mass of supplies to be installed inside the ship so close to liftoff over the second ATV mission, which launched in February 2011. Workers will place about 60 bags of cargo into the spacecraft next week, including crew care packages for each of the six residents aboard the international outpost. Another late addition to the ATV's cargo manifest is a pump for the station's urine processing system, which purifies waste water into drinking water for the crew aboard the orbiting lab. The fluids control pump assembly, provided by NASA, moves urine from a waste water tank into a distiller, which removes contaminants from the liquid. The 110-pound pump would normally be placed inside the ATV with other large pieces of cargo, but the assembly did not arrive when most of the ship's payload was loaded last fall. Instead, the pump must be carefully lowered through the craft's forward hatch, which points up when the ATV is attached to the Ariane 5 launcher. 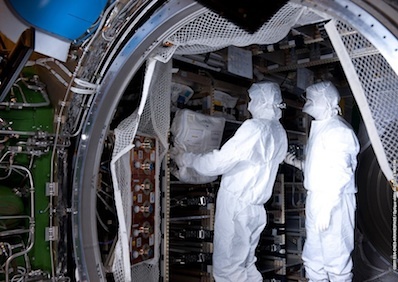 The Edoardo Amaldi cargo ship will remain attached to the space station until late August, when it will undock and burn up in Earth's atmosphere, disposing of trash from the outpost.